Friday night is weekly pizza night for many people, which is the inspiration behind today’s post. That said, once-every-seven-days is probably too much than is good for your health, in my opinion. Especially if you’re doing the traditional processed food toppings on a highly refined white bread crust—not to mention all that deliciously ooey-gooey cheese. Don’t get me wrong, now. I love pizza, as evidenced by a few recipes here on my blog like heirloom pizza Margherita; white pizza with garlicky herbed ricotta, artichokes, and arugula; white pizza with swiss chard, white beans, and caramelized onions (and its sister, pesto pizza, with the same toppings); and “the best of both worlds” red and white pizza. So there’s certainly room for enjoying this Italian favorite in moderation in my world. Once a month, say, or even less? There’s no hard and fast rule here, but let your weight, health stats, and good sense be your guide. You will need: One pizza crust (choose what you like, though I strongly encourage going whole grain); 32-ounce container of part-skim ricotta cheese; fresh garlic, parsley, basil, and other herbs of choice; Parmigiana and mozzarella (go for Buffalo!) cheeses; roasted Brussels sprouts; caramelized onions; salt, freshly ground black pepper, and olive oil. 2. 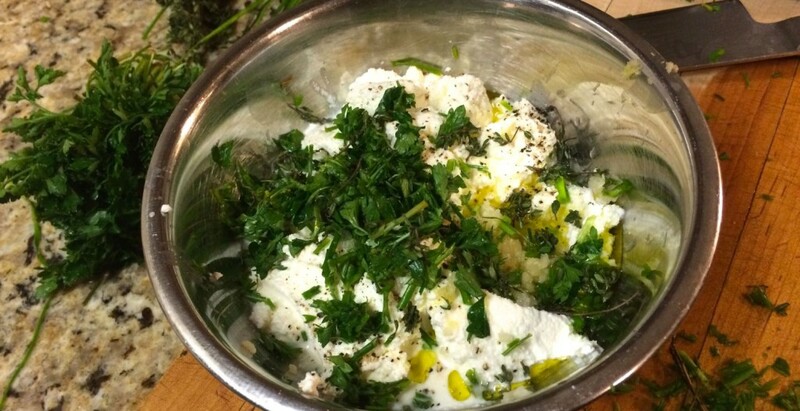 Mix up the herbed ricotta. There’s no need for exact measurements here, as in much of cooking, just mix the ricotta with a couple of drizzles of olive oil, a few crushed cloves of garlic, and the chopped fresh herbs of your choice; season with black pepper; let sit 10 minutes or so to allow the flavors to come out; and readjust. It’s really just flavoring the ricotta cheese to make it extra tasty. 3. Prepare the cheeses. Grate 1/4 cup fresh Parmigiana Reggiano cheese (it’s always better this way). Slice about 4 ounces of mozzarella. 4. Assemble the pizza. Coat a rectangular baking pan/cookie sheet lightly with olive oil, stretch out the dough, and pre-bake for 7 minutes at 425 degrees F. (You can skip this step but this method creates a less dense dough in my oven.) Spread the ricotta cheese layer over the crust (you will have some left over), leaving a nice edge for fingers, then scatter with 1/8 cup grated parm. 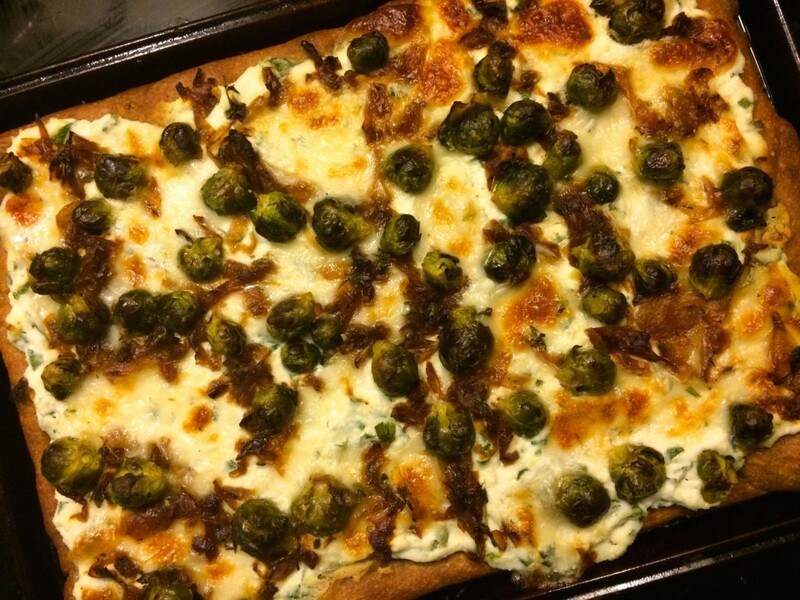 Top with mozzarella, sprouts, and onions. 5. Bake. Return the pizza to the oven for 7-10 minutes, until the cheese is bubbly, brown, and crispy in some places. Serve with remaining parmigiana cheese and crushed red pepper (if desired). 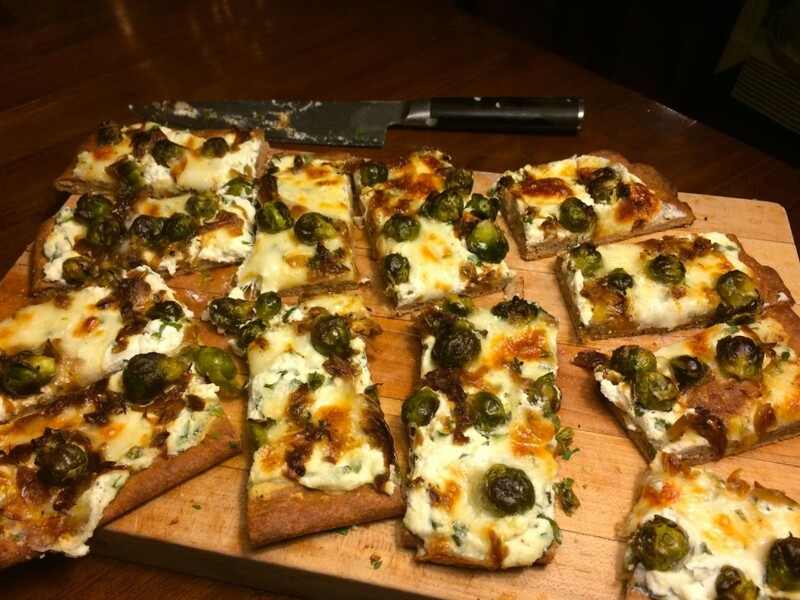 I hope you will have a “Who knew Brussels sprouts were so good on pizza? !” reaction to this recipe. I sure did. But don’t forget a big part of the story, which is that this dish was born out of leftovers. So much of my cooking style—as I mention all the time but it’s always worth reminding you—is making things in big batches to eat, freeze, eat again, eat again, and then morph into something new. Sure, you can start making this pizza from the beginning, but caramelized onions take a while and you may not be up for that. 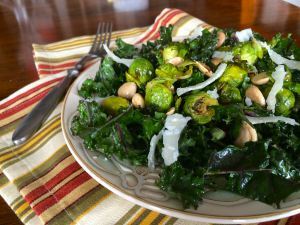 Perhaps easier—and certainly faster come pizza time—to make roasted brussels sprouts with caramelized onions and toasted hazelnuts for a meal and save the extra veggies for pizza night. Or keep your caramelized onions in the freezer so you always have them on hand; they bring a world of goodness to pretty much everything. Oh, and by the way, I had never heard of the phrase “Grandma Pie” until reading about it in Bon Appétit last fall. You can read more about it here. Or, you know, just start eating right now. Yum! I want to eat this right now. 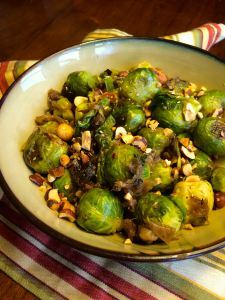 Brussels sprouts are sublime. 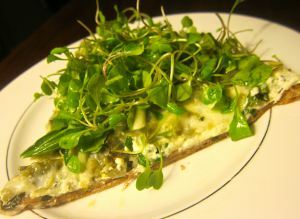 Love the idea of these toppings with herbed ricotta.